If you like the Vigilante, this is a great book. If you are not a fan, then this book has little to offer. This is especially true if you are not in an Ultimate Intrigue based game. I really like this book, but I feel the need to knock off a star because it is a little too specialized. I want something for Drow in this. Is this the Player Companion follow up to Ultimate Intrigue!? It sounds like it! Darn you, Paizo! I subscribed because of Arcane Anthology and Blood of Shadows and thought I could cancel after that...no, you had to bring in Magic Tactics Toolbox and now this! Cannot save money with you producing must-have items like this. Paizo and Steam are having confronted charisma rolls to decide who dominate my wallet. 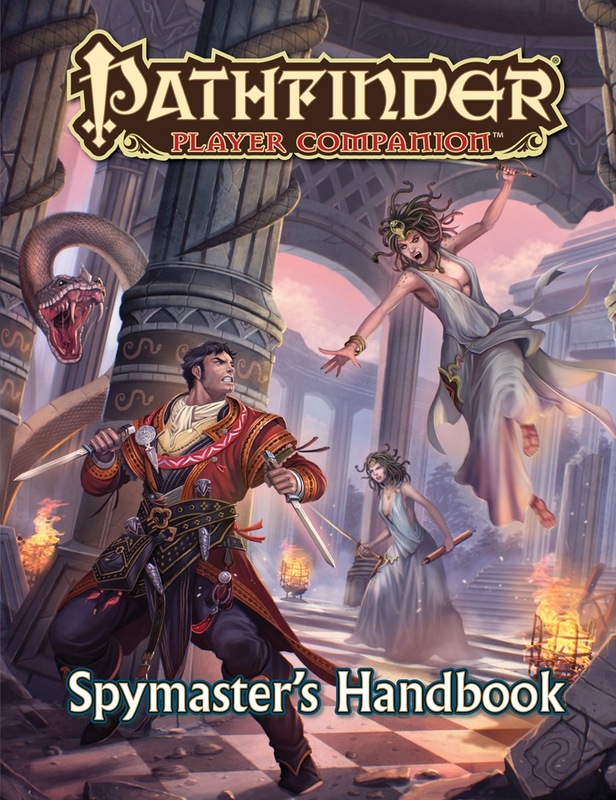 Hey Owen here are some 3.5 Pathfinder materials that have not been updated to Pathfinder RPG that are relevant to this topic that I would enjoy seeing updated. However, there is a chance some of this might be included in ultimate intrigue. I like the art, though I am sure it is only temporary. Darn. I think that would be an excellent cover. Spy themed characters are great, O am looking forward to see what this book is filled with. It sounds like Ninjas have not received a large amount of love in Ultimate Intrigue. I'm crossing my fingers for some Ninja love here, Owen! I like how Alric is caught alone in his social identity on this cover. Nice! I mostly like the fact we see flying Medusas. Medusi? Something like that. Yeah, it is a nice cover. The cover is showing a little more outright action than I would have thought for a espionage centered book. This cover reminds me of the Distant Shores cover that was the entire reason I decided to buy that book. Thanks for that clarification Kvantum. Buying and Selling information rules?! Fantastic. That art is fantastic as well! Medusae are always a welcome subject of art focus, IMO. Not that you should kill random innocents to preserve your cover, but the only people around being enemy combatants lets him go to town without worrying too much. Which leads me to believe those Medusae are in for an unpleasant surprise. Why would we look if it wasn't pleasant to do so?! That's how they get you. A Bellflower vigilante archetype?! Any chance of an Andoren or Twilight Talon archetype some time?! Not sure what Agathiel is (it may be something campaign set specific, I'm not thoroughly versed in Golarion lore yet), but Teiatsu (or similar translates to scout in a couple of Asian languages. So maybe a ninja like archetype? Agathiel might be something agathion-related, which would make sense for Andoran. No problem, as a super hero fan the vigilante really rings with me. I want to know it all. I kind of hope you're right on Agathiel, I have a strange fondness for agathion. Any chance this book will have any kineticist, sorcerer, and/or oracle love? Again?! If the class lends itself to being a spymaster, I think you already have your answer. If not, then no. On the other hand, it does say 'scheming abilities for any class'. You had me at "alternate new uses for skills." Finally. Looks like I will wait to see what is in this book before I might but it. It depends on what is in the book and how much I really want it. The cover looks quite nice, although I suspect the "flying" medusa of using some form of costume glue. Under normal circumstances there's no way that that kind of movement doesn't shift that sort of décolletage. Fantasy=suspension of disbelief. And have you not heard of artistic license?! I made a Brawler guide years ago and I haven't had to update the archetype section ever since. Paizo is really going for it with the Vigilante class! It sounds like they got some love in Inner Sea Intrigue, though. So not too much of a worry. This is the part I'm most excited about! While spellcasters get more and more options as new spells come out, and martials get new options as more and more combat feats (and stamina tricks) come out, skill-focused characters (already weak to begin with) have seen little increase in what they can do with skills. And so the relative value of skills (relative to the value of feats and spells) started low, and has been on a downwards trajectory since then. But periodically adding new uses for skills sounds like a great way to help the value of skills keep-up with the rest of the game. So I'm really happy to see this addition. And I hope it becomes a regular feature in companion releases from now on! It's probably too late to make requests, but the skill-use I'd most like to see introduced is one that allows characters and monsters with high Stealth scores able to quietly dispatch lookouts, or guards. --Without this talent/feat, if you attack someone (even if they're unaware of you, and you drop them in a single round, or even with a single blow), the DC for anyone hearing is -10. Not (Stealth check-10), but -10 period, regardless of how many ranks of Stealth you have. --With this talent, if you attack someone who is unaware of your presence, the DC for hearing your attack is (Stealth check-5). Speaking as a DM, this is a frustrating nerf to a lot of stealthy monsters who don't have at least 2 levels of vigilante or 10 levels of rogue. Want a vampire with a 7 levels of aristocrat and a base Stealth bonus of +25 stealthily take out the guards in the citadel the PCs are guarding? According to the implicit ruling here, that's impossible! Want a spectre to manifest and quietly eliminate those on watch? According to the implicit ruling here, can't be done! And that makes it much harder to set up natural plot points which involve creatures doing precisely these kinds of things. Have the confirmations for this book started yet, or do we have an estimate on it? I'm chomping at the bit for this book. They don't even have a June subscription thread up yet. Pretty certain those won't start until middle of next week. I too and pretty excited about this one. What is the content table for this? Anything for Drow in it? Give it time. I'm pretty sure they'll post something when they get it.